We are asked from time to time whether or not we will sell only the shafts so customers can install them on their heads, or have their local golf club maker install them. It is certainly easy to install heads on shafts with many tutorials available on the Internet. But there are complications relative to how the shats are cut that most people don't think about. So this page will describe those complications. We will sell the shafts for customer-installation, but there are some reasons why this may not be a good idea relative to cost and function. I will discuss those reasons on this page. Shaft requests are usually relative to our 2-piece shafts that can fit any iron, putter or driver head. Our shortest-collapsed-length .335" tip 3-piece shaft can be installed in a driver head, but it would only yield about a 38.5 or 39 inch extended length. It is designed for the Whole-In-One Adjustable Loft Club and does not fit into iron or putter heads which have a .370" hosel. And of course, telescopic shafts cannot be installed on putter heads that are designed with curved shafts because the shaft can’t telescope past the curve. We have made custom shafts for people with curved-shaft putters by creating a fixed epoxy coupling just above the curve. This doesn’t yield as short a collapsed length, but it makes it possible for them to travel with it. This individually-machined coupling is an additional $25, and the collapsed length isn't nearly as short as a straight shaft putter. 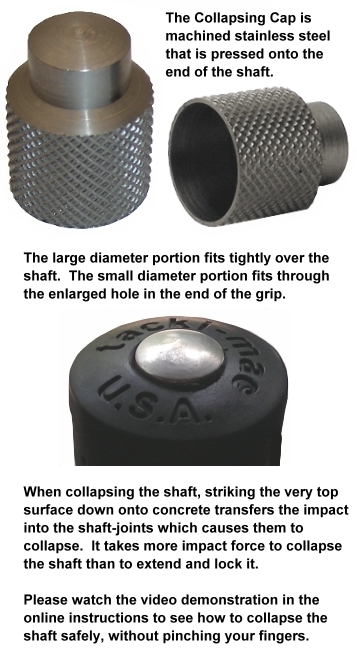 Telescopic shafts require a collapsing cap (click here to see the collapsing cap). They cannot be collapsed without it. We can install the collapsing cap and our basic Tack-mac grip pictured here, or just include the collapsing cap and you can install it along with your own grips. The cap is a press-fit which can be pounded onto the end of the shaft with a hammer. You would need to drill out the little hole in the end of your grip to allow the end of the collapsing cap to fit through. The size of the bit depends a little on the type of grip material and how much it stretches while being drilled. We use a 15/32" bit for the Tacki-mac grips which have a harder end-material than most grips. We recommend that you start with a 3/8” bit. You can always go larger if need be. If you order a shaft, be sure to let us know if you want us to install the cap or just include it for you to install, and whether or not you want us to include a grip (installed or separate). A shaft and collapsing cap, with or without a grip, is referred to on this page as a "shaft assembly". Cost: The heads are one of the least expensive components of our clubs. The shafts are the most expensive, because of the number of cuts necessary to achieve the shortest collapsed length, and the machining of the inside and outside diameters to make them lock. Since we can get most component heads from our foundry supplier for only $15, the cost of purchasing a telescopic shaft assembly is the same as if you purchased a complete club from us, minus $15 for the head, based on the current lowest price on our website for that type of club. You can see the prices by clicking on the following links. If you ship the head to us and we fit it to a shaft so it yields the shortest possible collapsed length (discussed in more detail below), we have to do all the measurements and cuts without the benefit of our fixtures that allow us to process multiple shafts at a time. While we save a little by not supplying the head, we have more labor, so your cost is the same as if we supply the head. In other words, the same as the current cost of putters at $129, T&F drivers at $199, and wedges and hybrids at $139. In addition to the fact that you won’t save very much money, there are functional disadvantages of buying just a shaft assembly. When we make telescopic shafts, we start with one-piece True Temper carbon steel Dynamic shafts and cut them into 2 sections, then cut both ends of each section, so that the collapsed shaft is as short as possible to fit into your travel bag. So we make a total of at least 5 cuts. Where that first cut is made is different for every shaft. All the cuts are based on a measurement formula that takes into account the desired flex, the desired extended length including the collapsing cap, the hosel length and depth, and the ferrule if one is used. We then machine the inside and outside diameters of the sections so they lock together solidly when extended. When we make a custom shaft for a customer's head, or a non-standard inventory head, we do all this by hand one shaft at a time because we can't use the templates for our standard clubs. If we don’t have the head in our possession to include in the measurement formula, you will not have the final optimal results. For instance, the lower end of the grip section might not come all the way down to the top of the hosel or ferrule, or it might come all the way down with room to spare which could cause damage to the ferrule or the lower end of the grip section if it is rammed into the top of the hosel. Either way, the shaft sections would not be cut in a way that minimize the collapsed length or take into account the weight of your head and the club's final flex. To illustrate the length issue another way, the collapsed length of our T&F Driver is 26”. If we make a custom shaft assembly without having your head to enter into the formula, a standard-cut telescopic shaft might collapse to 28 or 30 inches which will make it more difficult to fit into your luggage, and the flex and performance will not be optimal. Therefore, with these disadvantages, most customers who want to install a telescopic shaft in their heads usually send us the head so we can cut the shaft to match their head and yield the shortest collapsed length and the best performance. Head Removal: If we need to remove your head from a shaft, that costs extra, which varies depending on the type of head. Most heads can be removed for $15 using heat to weaken the epoxy. But Ping heads are much more difficult because they install their shafts with frozen ball bearings which then expand-lock as they warm up. We have to drill a hole in the bottom of the hosel to remove them which is very difficult and time consuming...and leaves a hole that we fill with epoxy. We also have to taper the tip of the shaft. So we can’t put a specific price on this. It has to be based on shop time with a $100 limit. It is best if you can remove and send only your head. This will also save shipping cost because it is less expensive to ship a smaller box. 1) A .335 inch tip driver shaft which can be a maximum of 43.5 inches (shaft and grip) which will yield about a 44 to 44.5 inch final length driver depending on the head and hosel measurements. 2) A .370 inch tip iron/putter shaft which can be a maximum of 39.25 inches (shaft and grip only). If you want to order a shaft assembly from us, we would need to know which size of shaft you want, and the extended length of the shaft itself from tip to tip (***not including the collapsing cap, head or hosel***), and the quantity. Also, please let us know if you want us to install or include the collapsing cap and grip, and if you want us to sand-roughen the tip. If you want us to sand the tip, please include the hosel depth measurement and whether or not you will be installing a ferrule. Let us know what you want to do, or any questions. After we have all the information, we will reply with a final quote and the payment steps since we don’t have shaft-only options in our secure online store.